Kindle loves this project because... Cry You One has the gift of being an artistic ensemble that embraces the complexities of what it means to live in and represent Southeast Louisiana--a region that is disappearing at an alarming rate due to environmental crises. Their work speaks to the necessary bravery of the regions inhabitants in speaking out, protecting, preserving and advocating for their land. Through their impressive, emotional and relatable outdoor performances and their diverse online story archive they are capturing the truths of their region with beauty and revitalized hopefulness. People, from left to right: Pam Roberts, Nick Slie and Lisa Shattuck. Photo credit: Melisa Cardona. One of the first steps in creating Cry You One, a digital media platform and immersive outdoor performance set at the edge of Louisiana’s disappearing wetlands, was choosing the location from which we would generate, grow and present our project. We determined early on that we wanted to work in St. Bernard Parish. Though one member of our team has deep familial roots in St. Bernard and another of us works at Nunez Community College, most of us live and work inside New Orleans. St. Bernard Parish is at the front lines of coastal land loss, and it has also been one of the areas hardest hit by hurricanes in recent years. During Hurricane Katrina, it was the site of one of the largest on-land oil spills in U.S. history, and it was the only Parish to be 100 percent destroyed by that storm. We chose to research and build our performance in this area to embed our efforts more deeply into the work being done by the people most directly impacted by subsidence and coastal erosion. Working in St. Bernard also helps us call the attention of New Orleanians to the parish next door, a place which often bares the brunt of environmental trauma that New Orleans has been comparatively protected from. Our journey led us to the 40 Arpent Canal near the E.J. Gore Pumping station, with the imperiled Central Wetlands as the backdrop for our work. The location of our performance also abuts the Los Islenos Culture and Heritage Society, who quickly became one of our first and deepest community partners, offering us great generosity in the use of their space and invitations to their gatherings, as well as a deep history of the land and the people who have known it. The Islenos are descendants of Spanish Canary Islanders who immigrated to Louisiana in the late 18th century. Many Islenos settled on Delacroix Island, an area of St. Bernard parish that has all but disappeared over the last 70 years. Through our connection with the Islenos Society, we met Celie Robin, who moved from New Orleans to St. Bernard as a young woman, and has worked as a shrimper and traiteur (a traditional healer). Mrs. Robin is one of the folks featured in the digital media component of the Cry You One project. 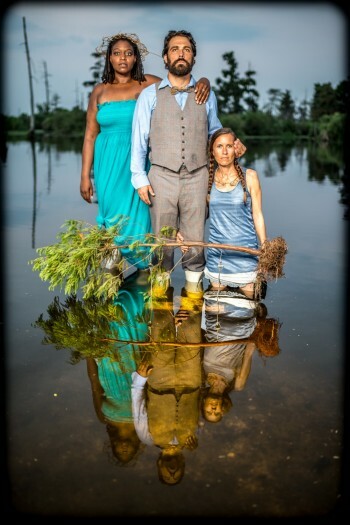 Beyond sharing information about the performance, our website serves as a platform where the wisdom of people’s stories can help educate and inspire people to get involved in the movement to save coastal Louisiana. In this clip, Mrs. Robin talks about her own environmental activism and what needs to be done to save the state’s coastline. Culture roots us to the land, fuels our resilience and vibrancy, and sustains our communities. Let us use this knowledge of art’s power—the music, dances and stories of our homes—to enlist all stakeholders in facing our very real challenges of building vibrant communities.